It's that time of year when deer become a bit ore bold and easier to get close to. Why? Amore! The other day I watched a buck and doe doing a little dance. I kinda feel bad for the buck, he was a handsome fella, not the biggest or best dressed but still a beautiful animal, and he was getting nowhere with this doe. This has been a very odd weather year. We had good rain for a while in mid fall, now we're in a bit of a dry spell again. It always seems as though the springs put out more water when it gets cold. I don't know, maybe I'm just imagining that. 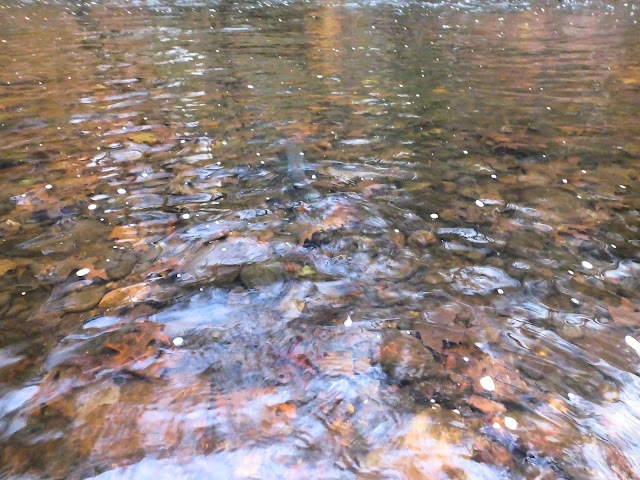 In any case the streams are running clear and near their average flows. Ice is forming on submerged rocks and sticks t night now, and yesterday it persisted throughout the day. The water itself was above freezing, but the surfaces of exposed rocks were not. Yesterday I visited two streams, both of which are tributaries of the same river but are on opposite sides. Both have wild brookies, one has wild browns and has produced wild tigers in the past too. Usually the one with only brookies is the one that I can be sure will give up a fish or two. The other is an oddball. It produces very regularly but with odd inconsistency. I caught my first wild brook trout there in 2011 and haven't caught a single fish out of that pool in the intervening years. Until today, that is. The pool above it is a consistent producer and has given up a number of nice wild brookies and browns over the years, and that's where I caught the first fish today. A super dark female. The next pool down is the one that hasn't produced fish for 6 years. I fished the Ausable Ugly through the run at the head of the pool and got no response, then leaned up against the fallen tree that splits the pool and flicked the fly into the deepest part. I let the fly fall, felt a tick, and saw some inexplicable movement I lifted the rod tip and was into a stunning male in spawning dress. Both of these brook trout were exceptional fish for the stream. What amazed me about the male is how much he looks like the first brookie I caught in that exact spot. It's been too long for it to be the same fish, but who knows , it could be on of his offspring. While I fished the other stream a red breasted hawk was shouting at me. I though he was just mad I was in his hunting grounds, but now I suspect he was telling me to go home because I wasn't going to catch another fish. Aside from one brightly colored hump backed male that I spooked from the tail of one run, I didn't see a single brookie in that stream. They're in there, but they weren't playing this time. I set goals for myself every year. Some years I accomplish most of them. This was not one of those years, though I did get my first pike, herring run stripers, and albies from shore, but there is an awful lot I failed to accomplish, either for logistical reasons or angler error. My failure to catch a grass carp, though I still have time, is a painful one. Yesterday, I accomplished a goal I set for myself sometime in late January and have worked towards with unwavering focus. And on Saturday, it finally came to fruition. I got the biggest small stream wild trout I've caught since 2013. I should qualify that statement, if the average flow is below 70 cfs and you can cast across it without shooting any line, it's a small stream. I've been fishing this one hard all year and I've made exactly the kind of progress I'd hoped to. I know where fish are likely to be and what they'll feed on, how aggressive they'll be, and I can pretty much assure myself that I'll catch trout any day I fish there, and if the conditions aren't going to be good I know not to go. 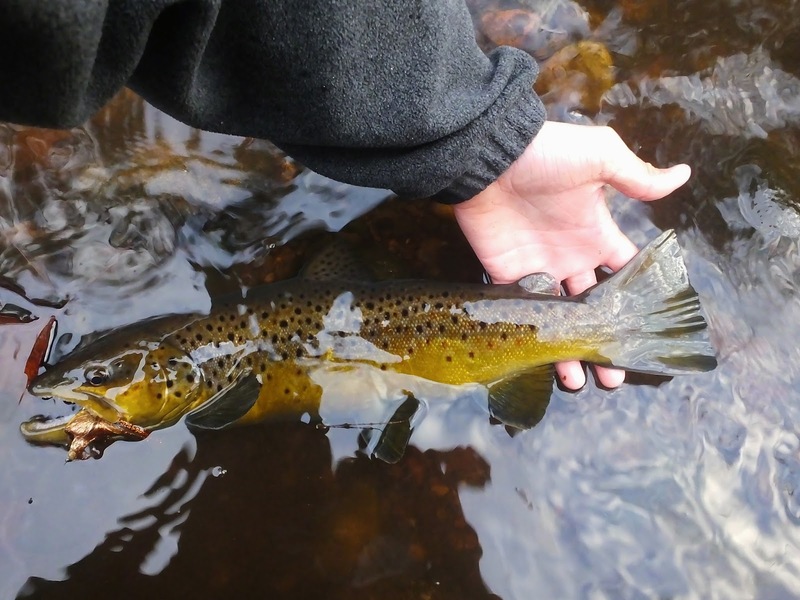 I caught my first wild brown via mouse there in late spring and had great streamer fishing through the winter. I knew late fall would probably be my best chance to get one of the stream's few giants, the wild browns in the 18-24 inch range. On Saturday I set out , planning to fish into the darkness, not really sure exactly what would happen but knowing that I would find some aggressive brown. The best I could hope for was that the fish would still be pre-spawn. I ground it out for a couple hours, not making the best of my shots, missing some good fish I shouldn't have. I don't let missed fish sway my confidence too much, it's the reality of streamer fishing. If you let that happen, you get soft, you don't see important details, and you don't hunt your fly. I kept hunting, and although I was frustrated by missed fish it pushed me on even harder. Eventually my hook found lip, and I brought to hand the first of the day: a beautiful holdover rainbow. I then covered about a half mile of water with no fish moved whatsoever. I began to doubt my fly and switched to a Drunk & Disorderly, which did not work either. After fishing five runs with that I switched back to the sparkle minnow, thinking I should at least not limit myself by fishing what is really an absurdly big streamer for such a small stream. 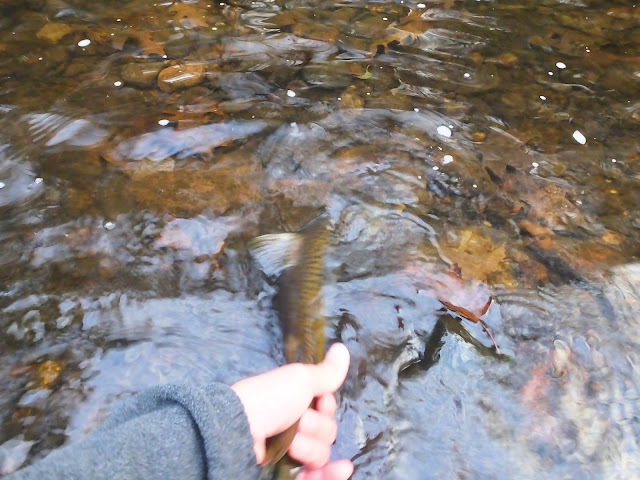 There are often long stretches of this stream that seem to be devoid of catchable size trout sometimes. Either that is actually the case, or ducks spooked them all... both are possible. I fished the first run with the sparkle minnow back on very carefully because it has a tendency to hold multiple fish. At the tailout I moved a very small fish, one too small to eat the streamer. Then a mid sized fish in the outside seem, twice, but it wouldn't grab the fly. at what I would consider the middle of the run, just on the inside of the fastest current, I pulled a sizable hen out of her lie and into the lee of a rock in front of me. I was sure she would eat the fly if I let her. I made my next cast upstream and past where she settled and she came a foot upstream to take. I got ready for the grab, and at the very last second she turned... making way for a much larger fish that I had not seen. He grabbed the fly, set the hook on himself, and charged off downstream towards a logjam. He made the mistake of stopping short and coming to the surface. When he got his head up I never let him go back down and made the fight a short one. I was a bit flabbergasted. This was a big fish, not a giant, but big. It measured against my rod at 19 inches, and it was not a thin fish at all. 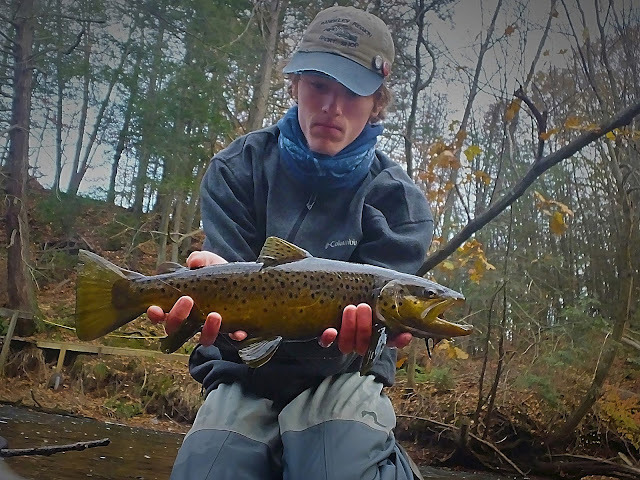 He also had the darkest spawning colors of any brown I've caught and a gnarly kype. I've caught a brown trout or two in my lifetime. Some have been really big. Some have been really colorful. One or two have been what might be classified as "once in a lifetime" events. This one isn't the biggest, and isn't the most colorful, but I'll be damned if it isn't one of the most memorable. I took my time with him. I held him gently with his head out of the water for no more than 4 seconds at a time. He did't need a revival, he hadn't lost much energy in the short fight and I could feel him wanting to go back, so when I was done admiring him I just let go of his peduncle. Watching a stunning fish like this swim off is what sustains me. I kept fishing, I caught more fish, but what more do you need to see? I'm content. I've been hoping to hear of big stripers within a reasonable day's trip from home. The fish are moving south quickly, but there are opportunities for big fish into December sometimes. I've been hoping to hear word of the right conditions in different areas that would call in big bass, but these things just aren't happening, at least not on time. Because I'm not one to use fishing reports to determine whether I should fish and where I should fish (something I feel people should start getting away from), I've been basing most of my predictions on what has happened in past years, what the current conditions are, and pure luck. I'm holding on to little shreds of hope that there is a 30lb migratory striper still in the sound and that if I keep fishing, maybe she and I will end up in the same place and she will eat my fly. So far, not so much luck in the cow bass department. Plenty of small ones... plenty of diaper stripers. Dan and I fished "way out" the other night, and fish were scattered everywhere there was moving water. The action was continuous enough that we got to play with the fish a bit, seeing what they did in Dan's headlight and how they behaved during the fight. We actually determined that all the fish made a hard left turn at a specific point in the fight, and sure enough they were diving towards an almost invisible depression... which happened to be full of fish. We also got to see a small fish chase down and refuse my fly in the light, which I was not expecting. A bright light usually puts the fish down. As it gets colder and the days get shorter and shorter I am beginning to feel the pressure. I so badly wanted to get a 40 inch striper on the fly this year, and I can tell you I was given more chances at that than most fly fisherman are in 10 years. There were two during the herring run, one that threw the hook 4 minutes into the fight and one that ate the fly at rod length, a few on the flat in June that I couldn't convince, one under a RR bridge that I trout set on, a particularly large one in late summer that I pulled the fly away from... I could go on but it hurts too much. There were also some very poor decisions made; spots left early, flies and leaders I should have changed, moves not made, moments excitement that got the best of me. I learn from all of it but I've had a hard time the last week or two convincing myself that I did all I could to seal the deal. I'm obsessed. Happy Thanksgiving everyone! I hope you all got to spend quality time with your families, ate good food, and maybe even got out to fish for a bit. I'm thankful for this continued mild weather... it won't last forever! I got a little bit of time on the Shetucket again the other day. 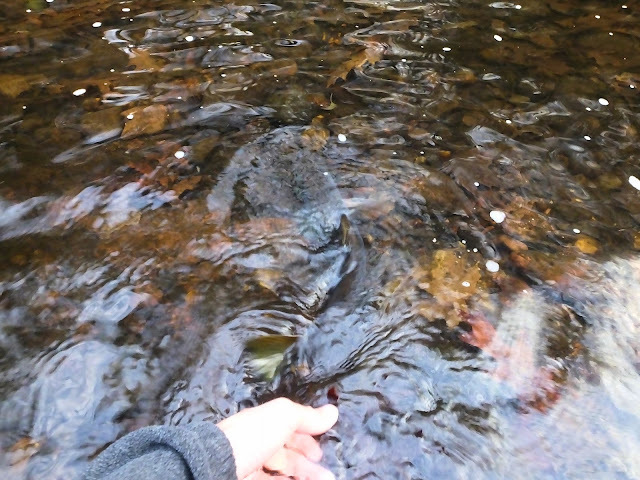 It was brutally slow, just one of those days where the salmon don't seem to be moving much. I tried different flies, different sizes, different depths, no confirmed grabs from Salmon. Then, in the final hour, working water I had never fished, I had a salmon come up and hammer my sz. 6 Sugarman Shrimp... when I laid my anchor! I had that fish well hooked and didn't think it would come back for the fly but I retrieved my next cast through that spot and wham, there he was. My first salmon spey casting! Not a big one, but he fought better than some larger broodstock salmon I caught on my last trip. Hopefully I get to fish for these guys another time or two this year, I'd really like to get a more substantial one. The fall run is winding down in Long Island Sound. It isn't done yet, and won't be until the first week or two of December probably, but most of the big migratory fish are gone. Those of us who were bit by the striper bug and just can't go a week without hooking at least a little one, well, we aren't done yet. Further and further from home we go to put ourselves in the thick of it. By December some of us will be driving through the armpit of America to get to the fabled blitzes of New Jersey, but for now we still have some fish close to home and not all of them are small. On Saturday Alec and I went out in near perfect pre-frontal conditions, the kind of weather that just get big stripers on the feed, and we were going to an area I had not yet explored. In the sound there are a lot of places where gravel bars, sand bars, or rock reefs extend far out into open water and make it possible to wade long distances from the beach. These places are consistently dangerous, but also extremely productive at the right times, so those of us smart enough to follow the tides and understand how the work will fish these places with minimal risk involved. But for those who aren't experienced in fishing "way out"... don't do it. Getting stranded by the tide is not good. It could just be inconvenient, but it could also be the end of you. This time of year a lot of birds are migrating and some make stops in Long Island Sound, many winter over here too. Today we were fortunate enough to be using the same stretch of shore as long-tailed ducks and white-winged scoter, two ducks I had never seen before. That's not to mention all the gulls and terns, of which there were hundreds. The first few hours on the water were frustrating, with little action in close and blitzing fish staying painfully distant, despite taunting us a few times by working gradually closer. But with the tide falling rapidly, white bait washed over the bar and became easy targets for both birds and fish. The approaching weather system, warming air, and strong southwesterly wind set the stage, and as with countless other late fall days here on the CT shoreline the play of life and death was acted out within fly casting range. The fish were mostly small, as has frustrated me all year, but you take what you are given. Chances were given, I had a 15-18 pound striper swipe and miss in the boulders where I'd expetect the big guys to live, but all 20 of the fish I caught we shy of 20 inches. The most bizarre thing happened at the while I was landing one of the many aggressive little school bass. I got it withing close range, last 15 seconds of the fight, and Alec and I both watched it cough up something colorful. I immediately waded out and grabbed the object. It was a bag of peanuts, minus the peanuts. I've found some odd things in the mouths and stomachs of fish, but this one takes the prize. Please, I can't believe anyone still has to say this, DON'T LITTER! As the sun set I went to the windward side of the reef, and found that the fish on that side had come right into the wash and were feeding in less than a foot of water. I waded out a short distance to cast parallel, and caught fish after fish on my white Hollow Fleye. It's easy to ignore the brutality of the conditions, and how soaking wet you are, when it feels like you could hook a 20 pound striper on any cast. Though I do get frustrated I am eternally optimistic. Even now, sitting at home, I can imagine the fish I'm looking for. Big broom tail, cavernous mouth, deep bodied and iridescent... she has been around longer than me and has seen more sights than I ever will, but all she knows is that she needs survive, keep going, keep eating.. And that's just what I let her do. Soon. The clock is ticking.